Don't you love it when your horse trots over to greet you when you walk in the gate? Armed with a new set of shoes, we were ready to get back out there. I tied Commotion and Roy to the trailer where we saddled them up. This was the first time I'd saddled him tied to the trailer, which is a different deal for a horse than cross ties. Sometimes they pull back. Carefully and slowly, I swung the saddle pad and saddle up onto his back. He didn't worry at all, probably due to Roy next to him. I trotted him around a few times in the grass. His tail was up, his head was up, his nostrils flared. I made him keep it up, just at a trot, just long enough where he relaxed a little bit and started to listen to me, then I got on. 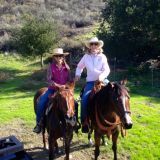 We rode right out from the house, Commotion, Roy and Badger, just cross country out in the sagebrush covered hills. There is a sort of trail that runs behind the houses there, down to where Dip Creek slithers toward the Big Wood River. Dip Creek is a tiny little waterway that is hidden in deep grass. It's completely invisible to see, but the horses must be able to smell it. Most horses don't like this little hidden creek. My mare, Ruby, who was pretty trail savy, never did get used to it. We rode right up to where the creek is, but instead of attempting to cross it, we took a turn to the east and followed it up past the willows and around the hill to its source. Walking around the large mud bog in a wide half circle, we were on the other side. The terrain is such that following the creek back is impossible, so we zig zagged up the steep (and I mean steep) hill under the pine trees. 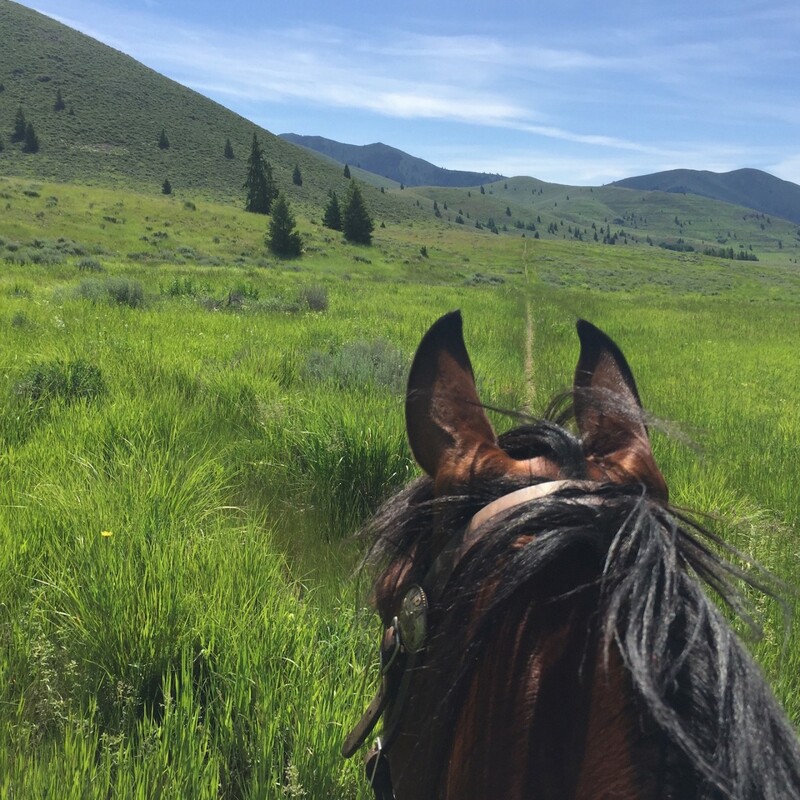 Leaning forward in my saddle I held tight to his mane and ducked my body as low as I could, burying my head in his mane, as we scrambled across the soft ground to the top. There we stopped. Commotion's heart was beating away and his expression looked like he'd just accomplished an impossible feat. We followed Roy around the hills, no trail to follow. Badger was sometimes behind us or sometimes off somewhere to either side. The day was warming up and there was a gentle breeze. From below Roy's back feet a sage grouse burst out from the bushes and fluttered away right in front of us and to the left, trying his hardest to lift his fat little body toward the sky. Commotion didn't flinch. He watched it but that's all. It seemed he'd never even known there were things like that out in the world that might be worth spooking at. Climbing and descending the hills, he focused on where to place his feet, how to balance his body. One place in particular, I could feel him hesitate. "Oh, Lisa, we can't do that, it's way to steep." It wasn't, and he could, and we did. Walking back toward the house, our route led us back to Dip Creek. By this time he was very relaxed, his nose right in Roy's tail. Focusing on the far side of the creek, I tried to not let my body let him know that there was water ahead. Roy strode across with barely a pause. Commotion followed along and right as he crossed over, his head popped up a few inches, as if he'd been stirred a little bit from a deep dream. He may have not even known he crossed over it. We didn't go back and do it again, I like to keep things as little of a deal as I can and we know there is plenty of water to play in all summer, so that was it for the day. I believe for a young horse, the more time spent where there's nothing to worry about, the easier it will be when the time comes that there is something to worry about. Today was a good easy day.